Primer to equalize rough, porous, absorbent or slightly sanding renders/plasters and concrete surfaces and interior gypsum building and plasterboards before applying emuslion-, silicone resin- or polymer resin paints. For exterior and interior use. 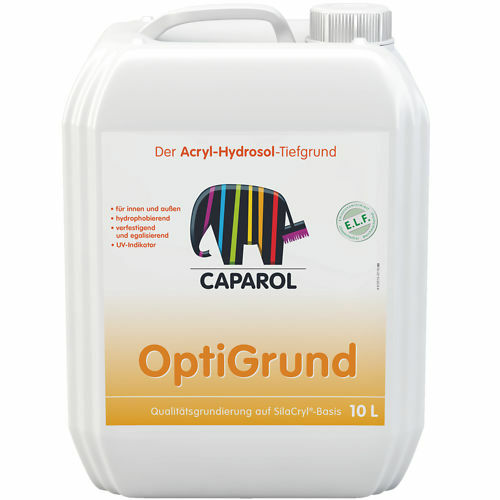 OptiGrund E.L.F. may also be used in rooms without explosion-proof fittings or in insufficiently ventilated areas, as well as in rooms used for processing or storing foods and luxury foodstuffs. Due to the special SilaCryl technology (extremely fine particles) the material is deeply penetrating and enhances hydrophobic properties. In conjunction with a black light lamp, the special UV indicator provides verification of priming even after a following coat. To do this, the coating is carefully scraped away down to the substrate and illuminated with an ultraviolet lamp. OptiGrund E.L.F. is then characterised by a bluish/purple reflection. Silicone modified, aqueous acrylic resin hydrosol.